HeroCraft is rapidly approaching version 1.5. The updates to 1.4 grew until I realized it was a major overhaul, and now I'm working double-time to get the game to 1.5. Barring any severe bugs brought about from the updates (and changes to flavor text as art comes in), 1.5 will be the game that goes to production. After three-and-a-half years in the making, I'm definitely ready to see it at this point. Next week I'm going to playtest the game with some friends, so I have my work cut out for me getting it all ready. Below are some of the changes. The board itself hasn't received a proper update in some time, and was an area of weakness from a strategic standpoint; the older layout didn't foster any real decision-making on its own. Although the board size remained the same, the locations and rules for terrain were changed. Under the new rules, Forest and Mountain spaces can now be entered for the cost of extra movement points, while Water spaces remain impassable. Additionally, I've focused more of the challenging encounter spaces in Forest and Mountain areas, hopefully encouraging players to congregate, and even creating safety zones for fleeing/hiding (a low movement roll won't let you get far into either terrain space). There are now several choke-points to spark player-duels and promote logistical consideration. Distances to important areas from Cities have been balanced as well. After struggling for a long while on the function of my Boon types, I finally summoned enough courage to cut the Item sub-type, as it didn't offer anything different than Followers (passive benefits). To reconcile the loss of five cards I added new cards to each of the remaining types: Weapon, Armor, Spell, and Follower. The second part of the Boon revamp was to finally update all text with a new action-based system. Every Boon, Attribute, and Relic (some Monsters too!) have abilities, and these abilities now come in one of four action types: Ambush, Combat, Passive, or Turn. This also allowed me to institute a reaction-based component without having to get involved in something complex like the stack in Magic the Gathering; players can use Turn abilities on any players turn, and they Refresh at the beginning of their turn. Spells like Augment (previously Divine Power) can now be saved and used if the player is attacked by another player. 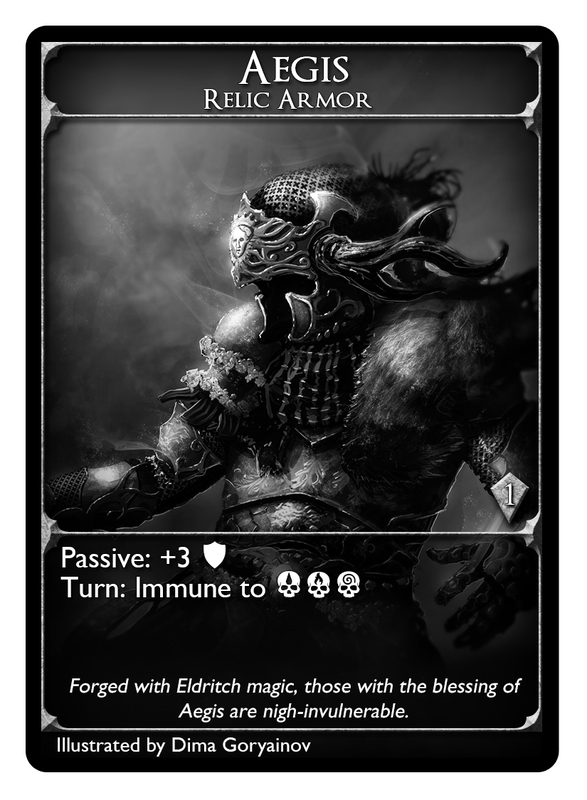 To accommodate the text changes I redesigned the card layouts to maximize as much real-estate as possible while keeping the overall look the same. I also finished the suite of icons representing the four major economies: Defense, Coin, Experience, and Power. Other important parts of the game received corresponding symbols including the Conditions (Burn, Poison, Stun) and Refresh mechanic. HeroCraft has been the project name for the game, but when it comes time to release the product I'm planning on using a different name. One of the biggest hurdles in this version was re-branding the game so that every piece fit into a cohesive whole. I think I've done it, and have several documents with the story, background, etc ready to reference. I plan on working with my original artist, Dima, to realize the new name and create box-art to solidify it. Once that happens I'll reveal it all, and the changes to certain elements (like moving from Fame to Power as the name for the victory points system) should clarify themselves. Now that I've written more than anyone cares to read, here's the latest card and first Relic to get art: Aegis, illustrated by Dima Goryainov.